Dreaming of new countertops to refresh and restyle your bathroom or kitchen design? Looking for detailed information to learn about all the options, features, pros and cons of the many different types of countertops for your bathroom or kitchen remodeling project? How about floor tile... a kitchen backsplash... or outdoor kitchen? Or how about countertop care & cleaning advice? Well, you're at the right place... It's all here! Choosing the best countertop for your project is a big deal. It's fun and exciting! The right choice will update your style, enhance entertaining, improve the function of your kitchen or bath, provide years of enjoyment, and add significant value to your home. However, it can be a challenge to sort out all the incomplete, inconsistent, conflicting and confusing information circulating online and elsewhere regarding the features, benefits, performance, installation, cleaning and maintenance of the various counter top materials. To help you cut through all the clutter, the myths, misinformation and marketing hype by providing the most in-depth, unbiased and accurate information you'll need for your counter top project to succeed. Tried-n-True cleaning product recommendations... and much more! Designed with YOU in mind this website is a comprehensive "consumer resource" providing over 1000 pages of the most current and relevant countertop information for you to explore and discover to help create the design of your dreams. So, keep reading and click around! Home décor tells a story and naturally becomes an extension of you, a reflection of your personality, point-of-view, individuality and style. You probably already have some ideas about what you want and you'll get many more and learn a ton on this website. So, have fun with it... make a statement... however, it's important to remember there's more to consider than that which meets the eye! Certainly any surface you choose must appeal to your taste and harmonize with your design theme, but it must also suit your lifestyle... that is, how you and your family use the surface... which depends on where it's installed... and of course, your budget... which will affect not only your choice of countertop material, but possibly color & finish choices (for some materials different colors/finishes are more or less expensive) and design details. Color, pattern & texture or "finish"
However, in our experience people tend to focus far more time and attention on the look and feel when deciding which countertop or tile material to purchase and neglect to consider the performance & durability needed for the particular use of that surface, which can have a dramatic impact on your overall satisfaction... and sanity! CountertopSpecialty.com is here with expert advice to help you figure it all out and understand the pros and cons of the key considerations to determine the best counter top surface for you. No... It's because of unexpected stains, etch marks, scratches or other performance and durability issues that weren't fully investigated. Sometimes shoppers feel they already know these things or think all cleaning is the same, so they don't spend much time learning about correct cleaning methods and maintenance requirements. Or they "just love" a certain material, color or pattern and "have to have it" devil may care. All too often designers, installers and sales reps do not properly educate the buyer (meaning limited or no information provided or even worse... incorrect information) regarding the characteristics, durability, maintenance requirements and appropriate use of available materials for counter tops or flooring. This is common when picking out natural stone counter tops or floor tile. Many think natural stone is all the same... "Stone is stone... what can you do to a rock?" Well, turns out that there can be a big difference between various types of stone counter tops, which leads to considerable shock and panic and learning the hard way when confronted by mysterious cleaning or repair issues. On this point it's helpful to recognize that a lot of available information regarding various counter top materials comes from companies trying to market their particular brand over others. So, the information is distorted. And unfortunately some information is just plain wrong. Quartz vs. granite countertops is a prime example. Quartz countertops are excellent and essentially perform as well as granite, so we highly recommend them. However, quartz manufacturers consistently stretch the truth regarding both the benefits of quartz and the detriments of granite to make it seem as if the two are night and day when in fact the two materials perform almost identically except for making repairs (which favors granite). "sealing granite countertops must be done annually" (not true). Solid surface and laminate countertop manufacturers are no different, so just keep this in mind when you read something online about durability and maintenance... especially when just given bullet-point "facts" without any explanation. 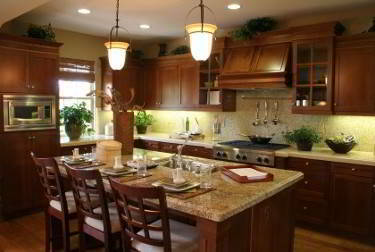 Granite or marble counter tops or any natural stone is not manufactured by any one company. Anyone can market and install granite, so there is never an incentive to "market" or "sell" stone over other materials especially when price and profit can be similar. Still many myths and misconceptions abound. On CountertopSpecialty.com we will always do our best to provide an unbiased explanation of any issue, so you get the complete picture and can understand the what, when, where, why and how of it all. So, to avoid a mystery surprise and possible disappointment with the ultimate results, be sure to honestly assess how the counter tops will be used in any particular location (bathroom vanity, wet bar, kitchen counter tops, etc.) along with who will be using them! For example, young kids, party guests or maybe Uncle Harry will be more prone to producing stains, etch marks, scratches, burns, etc. Consider yourself too... are you a neat-nick or..... not? Not all countertops are created equal. Performance characteristics vary considerably across surface materials. Even surfaces in the same "family" such as natural stone, laminate or quartz can show a marked difference in stain-resistance, or scratch-resistance based on the color or type of finish. And as previously noted, you can't always bank on the marketing message being entirely accurate. Understanding the true performance / durability (etch, scratch, heat, burn, stain-resistance) and maintenance needs of any material you are considering will help you get the most for your money. You'll certainly learn all about these issues after it's installed, but nothing you can do about it then except learn to live within the limits of the surface and deal with the maintenance demands. Are you willing to compromise on durability to reduce costs? Accurately assessing how your counter tops will be used can be just as important as picking that perfect color when matching your needs to the right countertop material. Of course, the installation location will affect the type, frequency and intensity of use. Now it's certainly possible to install any type of countertop material in any room of your home, but some types of counter tops will perform better than others for a given location and lifestyle. And of course, cost is always a consideration. The most obvious example is kitchen counter tops, which receive far more use than any other surface in the home. The constant abuse along with exposure to a large volume and variety of foods, drinks and other stuff can take its toll... So choose wisely. Granite and quartz countertops are by far the best choice for a kitchen. Soapstone is very good too. Marble is not such a good choice for kitchen counter tops. Cleaning marble is not difficult, but can require a more vigilant approach especially in the kitchen where "etching" and marble polishing is an issue. 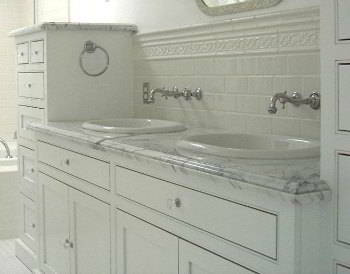 However, marble is just fine for most bathrooms and flooring. Concrete counter tops can be okay if maintained well, but scratching and etching can be problems. Granite tile is the top choice for a lower-cost option. Solid surfaces like a Corian countertop are also good budget considerations and you'll get the most for your money with laminate counters although performance cannot match the much more expensive granite or quartz. Bathrooms tend to have the widest variety of use patterns (frequency and intensity) depending on the type of bathroom: Master bath vs. the powder or guest bathroom vs. the kids bathroom, etc. So, choose your counter top surface accordingly. However, since bathroom countertops receive far less abuse than kitchen counter tops care & cleaning is typically not an issue provided you learn the right way to protect and care for the type of surface installed. Even though marble counter tops can etch from some personal products, it's fairly rare if you learn and follow our advice on marble cleaning. Think of these areas like a kitchen. They don't get nearly as much abuse as kitchen counter tops, however, they are exposed to a lot of acids (alcohol, sodas, fruit juice) and harsh detergents, cleaners and such, so marble, travertine and limestone should be excluded. Quartz is fine for a wet bar, but could be a problem in a utility room where exposure to common chemicals (bleach) could permanently damage the surface. Soapstone counter tops will actually be the most chemically resistant, but granite, solid-surface and laminate will perform well too. Your plan for an outdoor kitchen will certainly focus on installing the best countertop for outdoors. Outdoor kitchens have the same concerns as indoors, so marble is not the best choice due to etching. Dyed concrete and quartz counter tops can yellow with prolonged sun exposure. Ceramic or porcelain tile is a good option, but again granite slab or granite tile countertops will be the best choice for long-term durability and low maintenance. Project budgets and cost is always an important consideration. Of course, if money is no object, then you'll just choose the countertop material that suits your style and lifestyle. But no worries... even if you have a tight budget you still have plenty of options to satisfy your design dreams. Marble & Granite Countertops Price: $40-$200 sq/ft. The price variation is almost exclusively due to the color/variety of material you choose. Some stones are just more rare than others. But countertop edges, slab thickness, number of cut-outs, unique installation issues, etc. can all influence final cost. Quartz Countertop Prices: $45-$120 sq ft. Difference is mainly attributed to different brands, colors and finishes. Silestone prices can be a bit different than Cambria, etc. The average installation cost is very similar to average cost of granite countertops installed ($50-$60 sq/ft.). Concrete Countertop: $75-$150 sq ft. For this surface most of the cost is in the installation, which is almost an art to do well. Solid-Surface Corian Countertop: $30-$90 sq ft. At one time Corian was priced similarly to granite, but prices have come down some. Soapstone Countertops: $70-$100 sq. ft., but can run up to $150 for premium slabs. Slab quality varies a lot. The harder (lower % talc) the better. However, soapstone is soft enough that DIY installation is possible saving a bundle. Glass Countertops: $80-$120 sq. ft. Price range of recycled glass counter tops is mainly in the brand and material color choice. Granite Tile Countertops: $20-$60 sq ft. You save a lot on both material (tile is thinner) and installation, which can be done by a competent handyman (maybe you!) vs. a slab install that must be done by experienced pros. Laminate Countertops: $5-$30 sq ft. Some laminates are better than others and certain colors and finishes are more expensive, but you can really save on installation by a handyman or yourself! Well, you probably get it by now that choosing the "best" countertop has a lot to do with your needs for any particular room or location and requires a bit more thought and effort than simply buying your favorite color or what your friends and neighbors have. True, granite countertops will provide superior performance in nearly every type of installation with quartz countertops a close second. A couple consumer magazines rate quartz above granite, however, they never account for the fact that damage to quartz is almost always permanent, while damage to granite is almost never permanent. So, take your time and give thoughtful consideration to all factors: color, pattern, finish, installation location, frequency and intensity of use, cleaning, maintenance and cost. It's a bit of a juggling act, but hopefully you found enough useful information here on CountertopSpecialty.com to get you started on the right foot... with enthusiasm and confidence in the success of your countertop project. Good Luck & thanks again for stopping by!